Recent scanner items from BHNW.org. 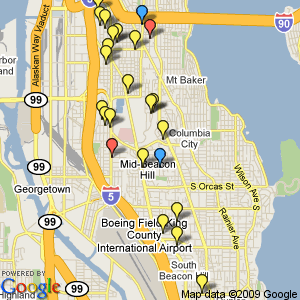 Blue: casing activity, yellow: burglaries or thefts, red: gunshots reported. The map to the right shows some of the scanner activity logged by the Beacon Hill Neighborhood Watch volunteers at bhnw.org since about November 23rd. Lots of burglary activity logged in the last couple weeks. A limping suspect presumed to be the source of several break-ins around 12th and Holgate, and the topic of several posts to the BAN list around Thanksgiving, was reportedly picked up by the police on December 2nd. I thought you might be interested to know that on Wednesday, Dec 2nd, at around 8.30 AM a man kicked in the front door of our 2nd floor condo in the Harwood complex. My wife was home and when she opened the bedroom door to see what the commotion was there was a man standing in our entry way on his way into our bedroom. Thank God, he was as startled as she was and he turned and ran! Here’s where the real story kicks in however. The man simply ran down a flight a steps, kicked in the door to another unit and tried to burglarize that one. He was still there when the police arrived. They came within a few minutes from calling 911, did a sweep of the building and quickly found and arrested him. As the woman walked along the trail, the group of teens “circled [the woman] on a dark section of the trail” and followed her. “One of the males rode in front while the three males and female rode behind [the woman],” the report says. The boy riding in front of the woman stopped and blocked her path, the report says, and tried to rip her purse off of her arm. While they struggling, one of the teens riding behind the woman rammed their bike into her leg, injuring her. The woman fought the teens off and was able to flee to a nearby home.